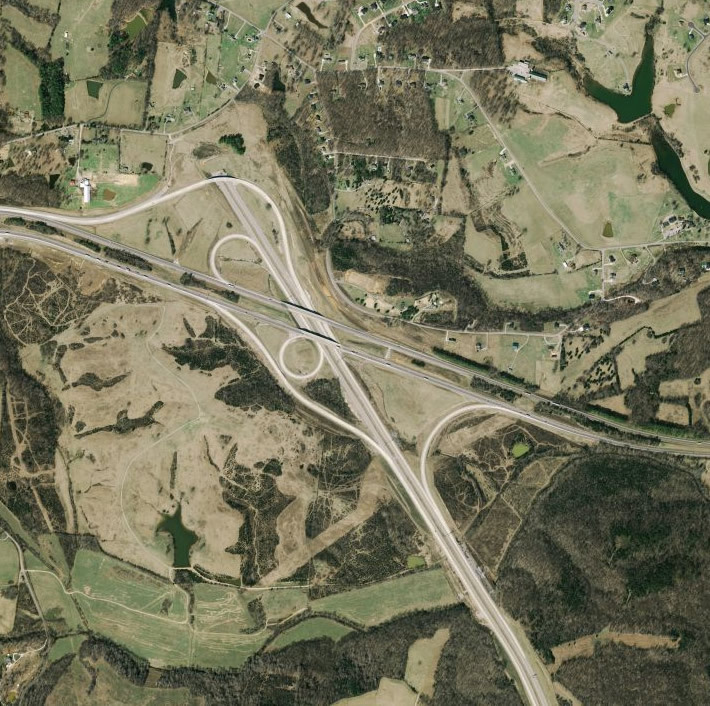 Originally envisioned as a full 187-mile beltway around the metropolitan Nashville area, Interstate 840 connects I-40 near Dickson with I-40 near Lebanon. The beltway was proposed as a solution for regional traffic needs so that the existing Nashville freeways could better support local traffic. Similar to the outer beltway (Grand Parkway / SH 99) around Houston, I-840 forms a complete bypass of the metropolitan area, providing a through route for the movement of goods and services. Critics of the beltway contended that the new road would open up land for unchecked commercial and residential development. TDOT announced that plans for SR 840 north of Interstate 40 were placed on hold indefinitely on October 31, 2003. Lawsuits and complaints from homeowners and environmental groups along the planned corridor, coupled with discussion involving the overall need for the route, led to the cancellation of the project at that time.2 No follow up work has taken place. The origins of Tennessee 840 date to 1975 with the recommendation for a beltway around Nashville in the 1975-79 Tennessee Highway System Plan.2 By 1986, the route became official under a proposal from Governor Lamar Alexander, and the subsequent approval by the state legislature. The route was also included in the Tennessee Better Roads Program. Planning commenced from there in 1988, culminating with actual construction by 1991. Newspaper reports at the time referred to the beltway as Interstate 840 rather than State Route 840. * – Special Committee on U.S. Route Numbering Spring 2015 Report to the Standing Committee on Highways May 14, 2015. Aerial image of the west end of then-SR 840. 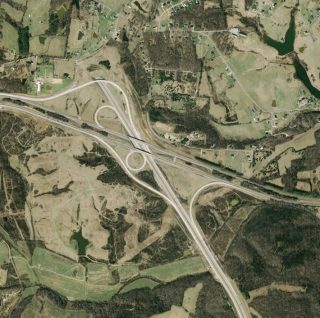 Although funding may never materialize, a freeway stub built at the western exchange of I-40/840 alludes to the proposed northern loop of State Route 840. Interstate 840 travels northward on the final approach to I-40 on the outskirts of Lebanon. Photo taken 06/10/17. Traffic shifts eastward to Exits 76A/B for Interstate 40 by a roadway stub leftover from original plans to extend the I-840 beltway northward. Photo taken 06/10/17. Interstate 40 heads east through southern reaches of Lebanon en route to Cookesville and Knoxville and west back toward Nashville. Photo taken 06/10/17. Interstate 40 bee lines east through Tucker Gap on the approach to Exit 235 with Interstate 840 west. Photo taken 06/11/17. Interstate 840 initially curves southwest from I-40 to SR 109 before taking a more southerly trajectory en route to Murphreesboro and I-24. Photo taken 06/11/17. One half mile east of the trumpet interchange (Exit 235) with Interstate 840 along Interstate 40 westbound. Photo taken by Carter Buchanan (06/11/17). I-840 angles southwest 23 miles to cross paths with I-24 near Murfreesboro. I-40 west enters the city limits of Nashville in 12 miles. Photo taken by Carter Buchanan (06/11/17). Interstate 840 branches southeast from I-40 in a rural area to the southeast of Dickson. Photo taken 06/10/17. The west end of Interstate 840 consists of a parclo interchange with Interstate 40 (Exit 176). Provisions were built at the exchange for a northern extension. Photo taken 06/10/17. Exit 176 departs from I-40 east for Interstate 840. I-840 ventures southeast along a scenic and winding course to Duck River Ridge and I-65 between Spring Hill and Franklin. Photo taken 06/10/17. Interstate 840 returns to I-40 westbound, one half mile ahead at Exit 176 near the town of Burns. Photo taken by Carter Buchanan (06/11/17). Exit 176 loops away from Interstate 40 west for I-840 southeast back toward Franklin. Photo taken by Carter Buchanan (06/11/17). The eastbound beginning of Interstate 840 from I-40 west precedes a loop ramp (Exit 1A) for I-40 east back toward Nashville. This ramp was built in for the unconstructed beltway leading north. Photo taken by Carter Buchanan (06/11/17). Tennessee Department of Transportation project web site. “TDOT Announces Decision on State Route 840 North.” Tennessee Department of Transportation (TDOT), October 31, 2003. Tennessee Department of Transportation 15 Project Case Study: Project Assessment Final Report State Route 840 South. Center for Transportation Research at the University of Tennessee, Knoxville, Tennessee, page 11. August 2003. "New Nashville bypass to help Memphis drivers" The Commercial Appeal (Memphis, TN) October 31, 2012. “Tennessee Adds New 77 Miles of Highway to Interstate System.” https://tn.gov/tdot/news/44772 Tennessee Department of Transportation (TDOT), news release, August 12, 2016. "Governor Bredesen Opens New Section of State Route 840." Tennessee Government press release, October 22, 2010.